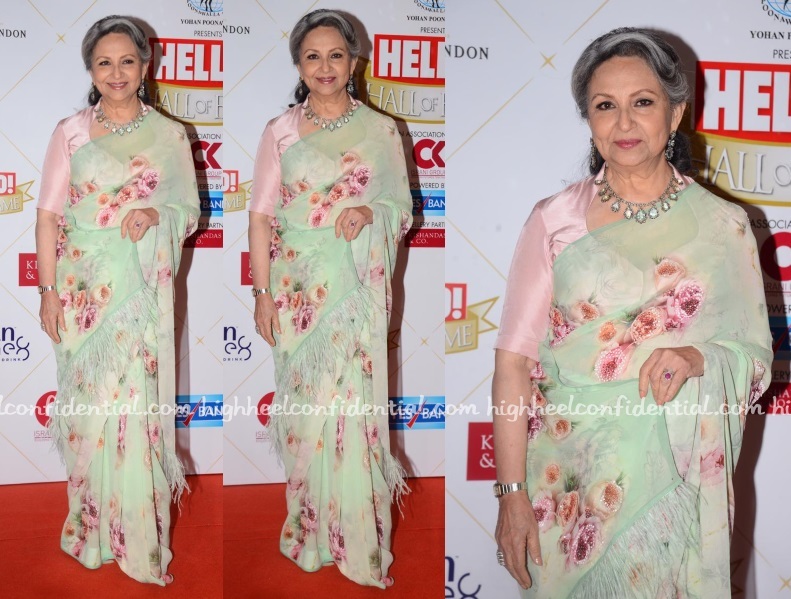 Wearing a floral print chiffon sari, Sharmila attended the Hello! Hall of Fame Awards on Sunday evening. She looked lovely! Coming back to the ladies, how lovely did they look in their saris? This week let’s throwback to ‘An Evening In Paris’, the Shammi Kapoor and Sharmila Tagore starrer. To be honest, I don’t quite remember the movie, but the leading lady sure left a lasting impression. I love the Sharmila of Ray’s movies (that’s another post entirely) but this one was quite something else. Maybe it was the poise and elegance with which she imbibed the fashion of late Sixties, a fashion era that am quite partial to. She delivered the style of the time and then some- bouffants, dramatic cat-eyes, tightly draped saris with short pallus and blouses knotted at the back that she wore through the movie. Though the styling wasn’t particularly path-breaking or novel for the time, the reason why it holds up so well even today is essentially because of Ms. Tagore. Some of the most stylish cinematic moments/movies have worked because of both the fashion employed and the chemistry brought in by leading ladies’ style in to the mix. 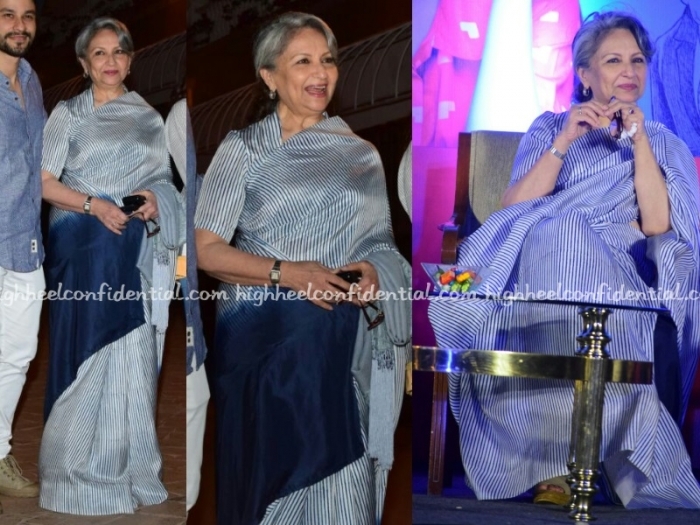 And Sharmila sure made those chiffon saris look super chic in Paris! A stand-out moment from the film was when Sharmila burst on to the screen in a swimsuit. A scene that caused mild controversy and some censoring on TV, but one that cemented the movie’s high-on-style status. Can we all agree she nailed the look? I mean it’s not easy competing with that blue unique to South of France and still come out on top! Anyone who can rock a one-piece swimsuit with pigtails is a-okay in my book. But kids, don’t try this at home. I wish I was able to source better images but this was all we could get our hands on. If you have any memories of this movie or any other that you particularly remember for the fashion of its time, I’d love to hear it! 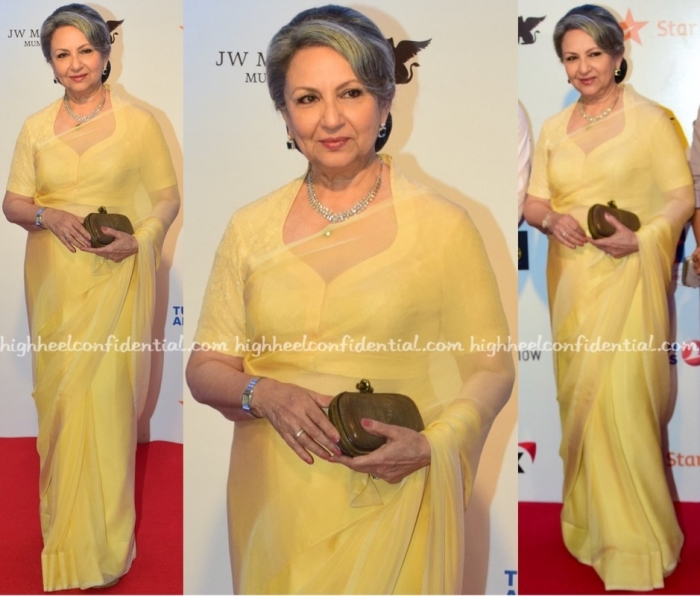 In her yellow chiffon sari, Sharmila cut a picture of absolute elegance on the MAMI red carpet. Diamond jewelry, a classic wristwatch and Bottega Veneta clutch rounded out the look perfectly. Nothing to fault here; she looked lovely. 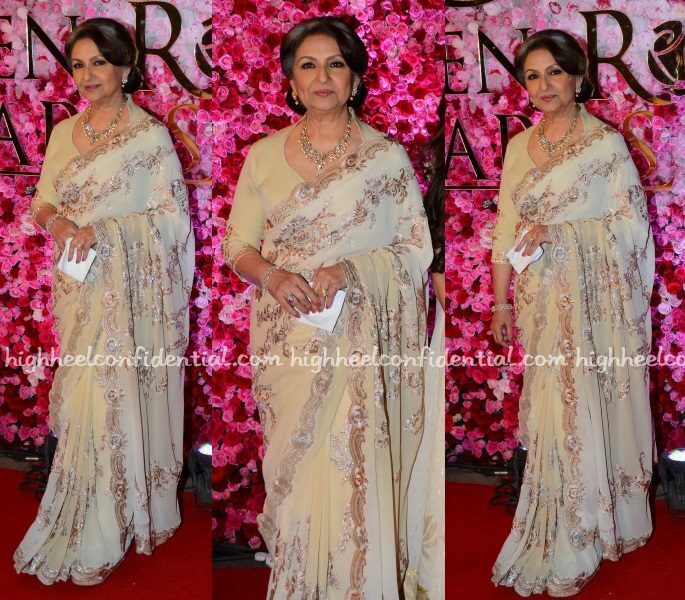 In her beige Suneet Varma sari and Amrapali jewellery, Sharmila was a picture of elegance at the Lux Golden Rose Awards 2016. Some of you may find the color a bit dull, but I thought she still made it work and the credit goes more to her. Just wish she’d had a potli to hide that tissue paper.